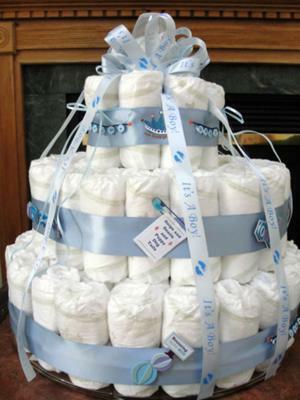 This baby boy diaper cake is beautiful! I love the delicate ribbon and bow on top and think this is such a delightful addition to a boy baby shower. This wonderful diaper cake was submitted by one of our fabulous visitors, Maire, who took the time to share her creativity and ideas with the rest of us. Thanks so much Maire, for sharing your cute baby boy diaper cake! diapers on the bottom row in tightly. The tray also had handles and made it easier to carry around. I used stickers and ribbons to decorate. Thank you for the instructions, it was my first diaper cake and everyone loved it. I must say for the first try, you really did an outstanding job! This just beautifully done! It is a real piece of art!